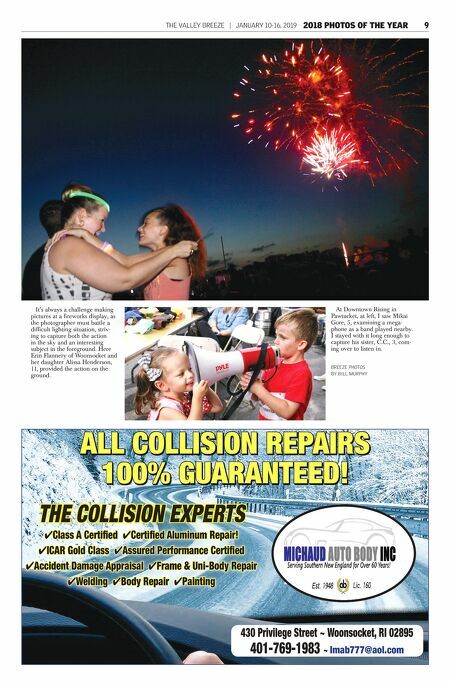 8 2018 PHOTOS OF THE YEAR JANUARY 10-16, 2019 | THE VALLEY BREEZE BREEZE PHOTO BY ROBERT EMERSON The spring ritual of a Little League opening day was, I had always thought, supposed to be a happy occasion. 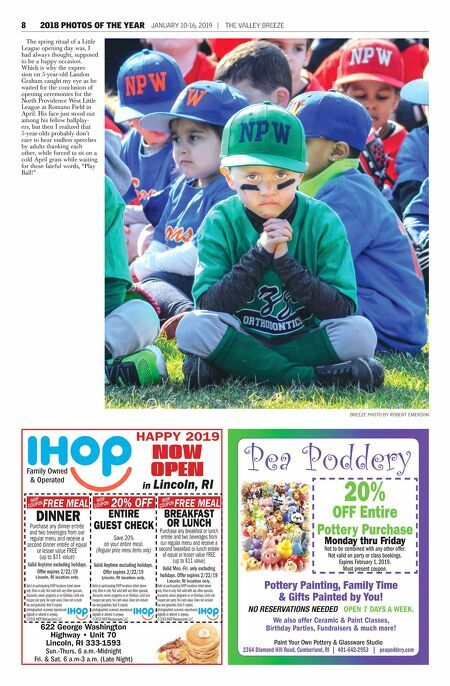 Which is why the expres- sion on 5-year-old Landon Graham caught my eye as he waited for the conclusion of opening ceremonies for the North Providence West Little League at Romano Field in April. His face just stood out among his fellow ballplay- ers, but then I realized that 5-year-olds probably don't care to hear endless speeches by adults thanking each other, while forced to sit on a cold April grass while waiting for those fateful words, "Play Ball!" NOW OPEN in Lincoln, RI 622 George Washington Highway • Unit 70 Lincoln, RI 333-1593 Sun.-Thurs. 6 a.m.-Midnight Fri. & Sat. 6 a.m-3 a.m. (Late Night) Happy 2019 Family Owned & Operated IHOP COUPON FREE MEAL DINNER Purchase any dinner entrée and two beverages from our regular menu and receive a second dinner entrée of equal or lesser value FREE (up to $11 value) Valid Anytime excluding holidays. Offer expires 2/22/19 Lincoln, RI location only. Valid at participating IHOP locations listed above only. Dine-in only. Not valid with any other specials, discounts, senior programs or on Holidays. Limit one coupon per party. No cash value. Does not include tax and gratuities. Void if copied, photographed, scanned, reproduced, digitally or altered in anyway. ©2018 IHOP Restaurants LLC. IHOP COUPON 20% OFF ENtIRE GuEst ChECk Save 20% on your entire meal. (Regular price menu items only) Valid Anytime excluding holidays. Offer expires 2/22/19 Lincoln, RI location only. IHOP COUPON FREE MEAL BREakfast oR LuNCh Purchase any breakfast or lunch entrée and two beverages from our regular menu and receive a second breakfast or lunch entrée of equal or lesser value FREE (up to $11 value) Valid Mon.-Fri. only excluding holidays. Offer expires 2/22/19 Lincoln, RI location only. Valid at participating IHOP locations listed above only. Dine-in only. Not valid with any other specials, discounts, senior programs or on Holidays. Limit one coupon per party. No cash value. Does not include tax and gratuities. Void if copied, photographed, scanned, reproduced, digitally or altered in anyway. ©2018 IHOP Restaurants LLC. Valid at participating IHOP locations listed above only. Dine-in only. Not valid with any other specials, discounts, senior programs or on Holidays. Limit one coupon per party. No cash value. Does not include tax and gratuities. Void if copied, photographed, scanned, reproduced, digitally or altered in anyway. ©2018 IHOP Restaurants LLC. Pea Poddery Paint Your Own Pottery & Glassware Studio 2364 Diamond Hill Road, Cumberland, RI | 401-642-2953 | peapoddery.com Pottery Painting, Family Time & Gifts Painted by You! NO RESERVATIONS NEEDED OPEN 7 DAYS A WEEK. We also offer Ceramic & Paint Classes, Birthday Parties, Fundraisers & much more! 20% OFF Entire Pottery Purchase Monday thru Friday Not to be combined with any other offer. Not valid on party or class bookings. Expires February 1, 2019. Must present coupon.